Student research opportunities are central to our mission. 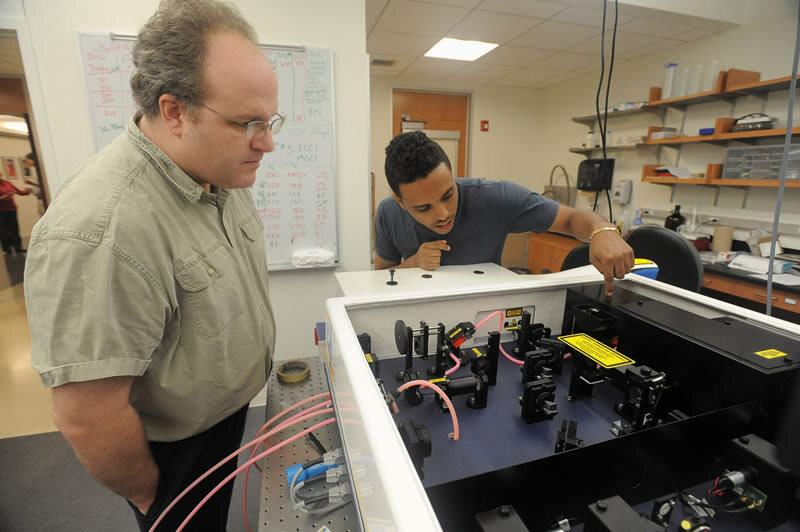 We welcome students to collaborate with faculty in our research labs, whether they are senior physics majors or undecided first-year students. A number of students also participate in Research Experiences for Undergraduates at other institutions. Many student projects have been presented at the spring Wheaton Academic Festival, at local and national conferences, and in professional publications. Summer 2016: Yuying Sun. “Analyzing the motion of a chaotic pendulum”. Funding: Wheaton Merit Scholarship awarded to Yuying. Summer 2016: Macgregor Sullivan. “Assembling and testing an astronomical spectrograph”. Funding: Wheaton Merit Scholarship awarded to Mac. Summer 2016: Raymond Zhang. “Analyzing the motion of Barnard’s Star”. Funding: NASA/RISG (Proposal PI: Maitra, co-PIs were Profs. Jenni Lanni and Laura Ekstrom in Biology). 2015-16: Aaron Portanova. “Designing a full-dome digital projection unit”. In collaboration with Prof. Tim Barker. 2015-16: Madison Borrelli. “Designing a sundial customized for Wheaton’s location” Funding: WRP. Summer 2015: Madison Borrelli. “Modeling spectral energy distribution of X-ray binaries”. Funding: Mars Faculty/Student Research Grant. 2014-15: Allegra Kurtz-Rossi ’15. “Timing analysis of X-ray binaries”. Independent Study. 2014-15: John Scarpaci ’17. “Correlation between multi-wavelength light curves of Aquila X-1 during different outbursts”. Funding: WRP. Summer 2014: Ryan Dill ’15. “Modeling X-ray spectra of black holes“. Funding: NASA/Rhode Island Space Grant (NASA/RISG). Summer 2014: John Scarpaci ’17. “Correlation between multi-wavelength light curves of Aquila X-1 during different outbursts”. Funding: Mars Faculty/Student Research Grant. 2013-14: Ryan Farber ’15. “Simulating black hole accretion disks”. Funding: Wheaton Research Partnership (WRP). 2013-14: Sean Weinstein ’17. “Analyzing soft-X-ray, hard X-ray, and optical light curves of the neutron star X-ray binary system Aquila X-1”. Funding: WRP.